Meet Emmett, the newest addition to the Splawn family. He eats up every moment of my days and some of my dreams too. 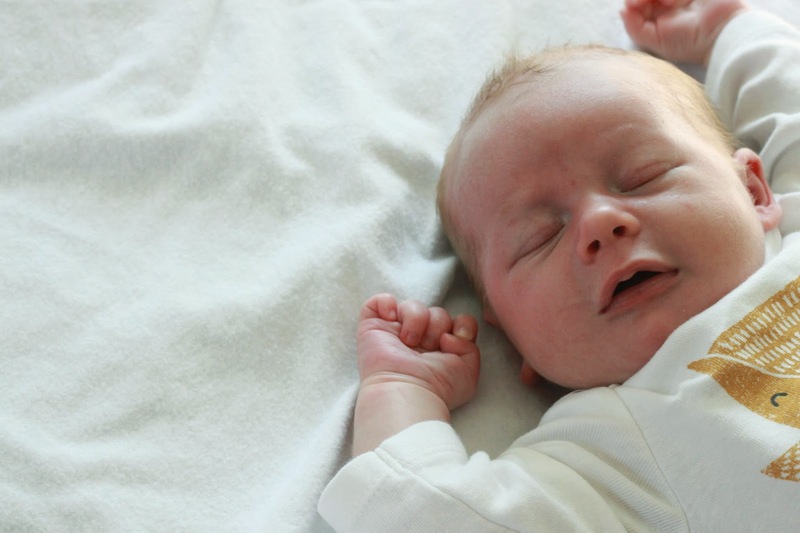 We're adjusting to life as four during the busiest, most joyous time of the year. My heart is crazy stupid full and so I, kind of, don't care that we didn't all the decorations put up and that my Christmas cards will probably be late, kind of. Here's to finally fulfilling my promise of cake, to filling your holiday with the things that make your heart full, and a some good ole procrasti-baking - from my crazy heart to yours. You can make the cake several weeks ahead, wrap them well in plastic wrap, and freeze. 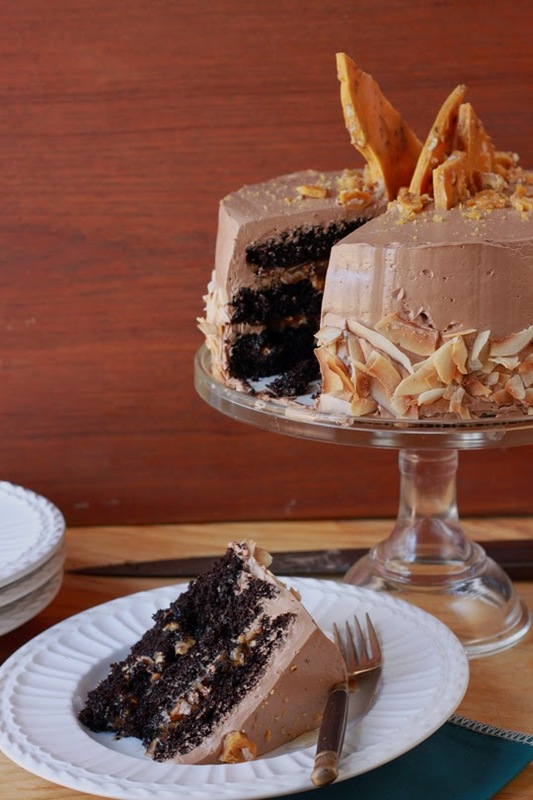 The buttercream, caramel, and toffee can all be made up to a week ahead. I made the parts of this cake over the course of one week after work and did the final assembly the day of. Presuming you have just one full day to prep this cake – it could be done all at once. Bake the cake first so that it has plenty of time to cool while you prepare the other ingredients. Make the caramel and let it cool while you toast the nuts and coconut. Make the buttercream while the cake cools and skip the toffee if you run short on time. Combine the sugar, water, and, corn syrup in a heavy-bottomed 2-quart saucepan. Attach a candy thermometer and cook over medium heat, without stirring, until the mixture turns golden amber and is approaching 320˚F. Immediately remove from the heat and add the coconut milk, vanilla extract and salt. Return to medium heat and cook until the mixture reaches 230˚F. 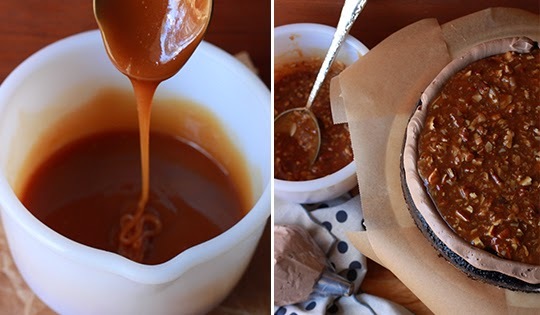 Pour the caramel into a heat-proof bowl and cool for 20 minutes. Fold in the coconut and pecans and cool completely before storing in an airtight container. The finished sauce can be made up to a week in advance – store in the refrigerator and bring to room temperature before assembling the cake. Fill a 4-quart pot about half way with water. Bring to a simmer over medium high heat. Combine the egg whites and sugar in the bowl of a stand mixer. Set the mixer bowl over the simmering water (the boil should not touch the water) and whisk the egg whites and sugar until the sugar has dissolved completely, the eggs are foamy and the mixture is warm, approximately 5 minutes. Set the bowl on the stand mixer and, with the whisk attachment, whip the egg whites and sugar on high until they reach stiff peaks and the bowl is cool to the touch, approximately 10 minutes. Meanwhile, microwave the chocolate for 30 seconds on high in a microwave safe bowl. Stir the chocolate and return to the microwave for an additional 15 seconds to melt the chocolate. 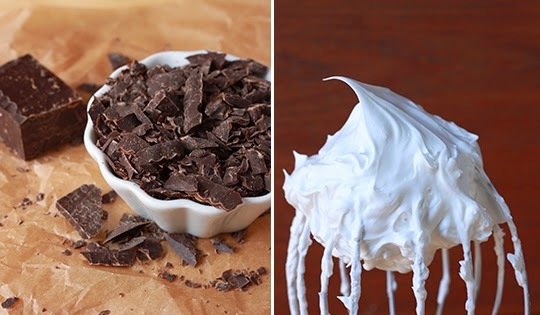 Set aside the cool while the egg whites whip. When the egg white mixture has reached stiff peaks begin adding the butter in 4 tablespoon pieces (about a half a stick at a time) with the mixer on low speed. Be sure that each addition is fully incorporated before adding the next. Once you’ve added about three-quarters of the butter – there will be a moment of panic – the frosting will look as though its curdled or separated. Be persistent and continue whipping and adding the butter. After the final addition of butter turn the mixer to medium high and whip for 1 minute. Return the mixer to low speed and slowly add the melted chocolate followed by the vanilla extract and salt. Mix for an additional minute and remove the frosting from the mixer. Store the frosting in an airtight container at room temperature for up to 3 days before assembling the cake. Lightly grease three 9-inch round baking pans. Dust the pans with extra cocoa powder and knock out any excess. Set aside. Whisk together the sugar, flour, cocoa, baking powder, baking soda and salt in a large mixing bowl. Add eggs, milk, oil and vanilla; beat with a hand mixer on medium speed for 2 minutes. Mix in boiling water. The batter will be quite thin. Divide the batter evenly between the prepared pans. Bake 30 to 35 minutes or until wooden pick inserted in center of each cake comes out clean. Set the pans on wire racks and cool for 10 minutes. Then, lightly run a knife around the inside of the pans to help the cake edges release. Flip the cake pans over, one by one, and tap firmly with the palms of your hands. Carefully lift up the cake pan; the cake should release easily. If it doesn't drop right out, drape with a warm wet towel while continuing to tap. Cool the cake layers completely before frosting. Gather the cake layers, filling, buttercream, toffee, a cake stand, an offset spatula, a piece of parchment paper, a zip-top bag, and a pair of scissors. A clean kitchen towel is helpful too. I prefer to frost cakes at my kitchen table rather than my counter – its just a little bit more comfortable. Prepare the cake stand by cutting the parchment paper into a few thing strips and place them around the edge of your cake plate (this will keep the plate clean while you frost). Put a dab of frosting in the middle of the cake plate and center the first layer of cake on top of it. Fill the ziptop bag with about a cup of the buttercream and snip off one corner. Use the bag to pipe a border of buttercream around the edge of the first cake layer. Fill the buttercream boarder with half of the filling. Top with the second cake layer and repeat, using the remaining filling. Top with the final layer of cake. Apply a thin layer of buttercream all over the cake – don’t worry if it is messy – this step is affectionately referred to as the “crumb coat”. Professional bakeries refrigerate their cakes after the crumb coat for about an hour – I find about twenty minutes set the thin layer enough to finish frosting the cake. Frost the cake with the remaining buttercream: Pile the buttercream on top of the cake and use the off set spatula to smooth the top of the cake while simultaneously pushing buttercream over the edge of the cake onto the sides. Smooth out the sides of the cake. 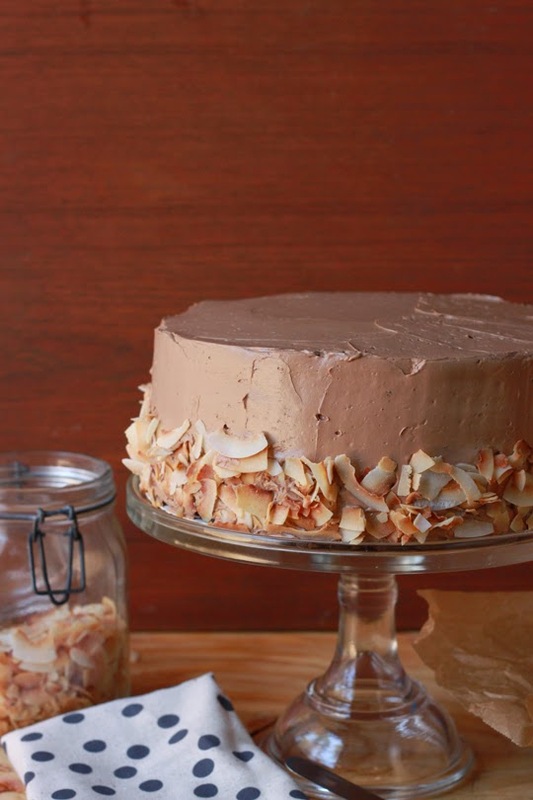 Press handfuls of the toasted coconut onto the sides of the cake. Remove the parchment paper and top the cake with broken toffee pieces. Enjoy.